Fa.Beau.Lux lenses can block 100% of both UVA and UVB radiation. UV400 rated protection sunglasses are essential to protecting your eyes against long term UV damage and keeping your eyes healthy. Fa.Beau.Lux sunglasses are made of high quality frame material and stretchable metal hinges that is durable enough for long time use. 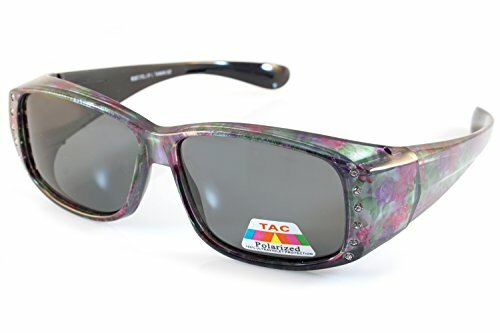 These sunglasses are suitable for any climate and weather conditions. Fa.Beau.Lux sunglasses are the perfect choice for outdoor activities such as walking, driving, shopping, and traveling. They are suitable as high fashion accessory and daily wear all year round. Protect your eyes without sacrificing your fashion style and comfort. 30 Days Money Back Guaranteed – In case any problem happens, please feel free to contact us to solve the problem until you are satisfied. You have no risk to try and we are here to provide you the best service! Glasses are for Demonstration Purpose and Not Included. Anti-Glare 1.0 TAC polarized Shatterproof Polycarbonate performance lens. POLARIZED LENS - Polarized sunglasses reduce glare reflected off of roads, bodies of water, snow, and other horizontal surfaces. Restore true color, eliminate reflected light and scattered light and protect eyes perfectly. Polarized sunglasses cut glare and haze so your eyes are more comfortable and can see better. Suitable for Houseboat, Driving, Running, Golfing, Fishing, Racing, and all Outdoor Activities. If you have any questions about this product by Fa.Beau.Lux, contact us by completing and submitting the form below. If you are looking for a specif part number, please include it with your message.